RYP Professional Development: Inclusive Prosperity Conference | Rochester Young Professionals, Inc.
Don’t miss the year’s most inspiring and informed discussions on how to create a more vibrant economic future for all of Rochester. 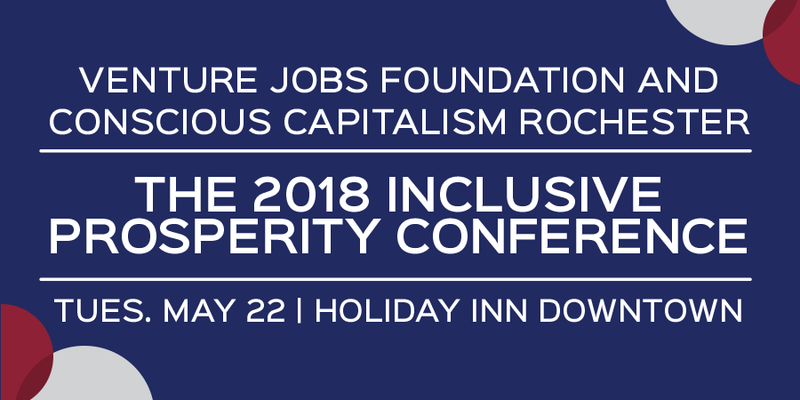 Featuring local and national thought leaders, entrepreneurs, finance gurus, conscious capitalist trailblazers, community investment experts, and philanthropic pioneers, the Inclusive Prosperity Conference will demonstrate what works, what’s possible, and what we can all do to create a brighter economic future for everyone – right now. Produced by two of Rochester’s most forward-thinking nonprofits eager to help new and seasoned entrepreneurs and businesses thrive in this region, the Venture Jobs Foundation and Conscious Capitalism Rochester are partnering to foster the connectivity, collaboration and idea sharing that supports the growth of inclusive entrepreneurial ecosystems. Tickets are $120 for the full day conference including breakfast, lunch and happy hour, but RYP members receive $75 tickets with code TXCCR2018.